What could be more patriotic than looking for meteorites on the 4th of July? 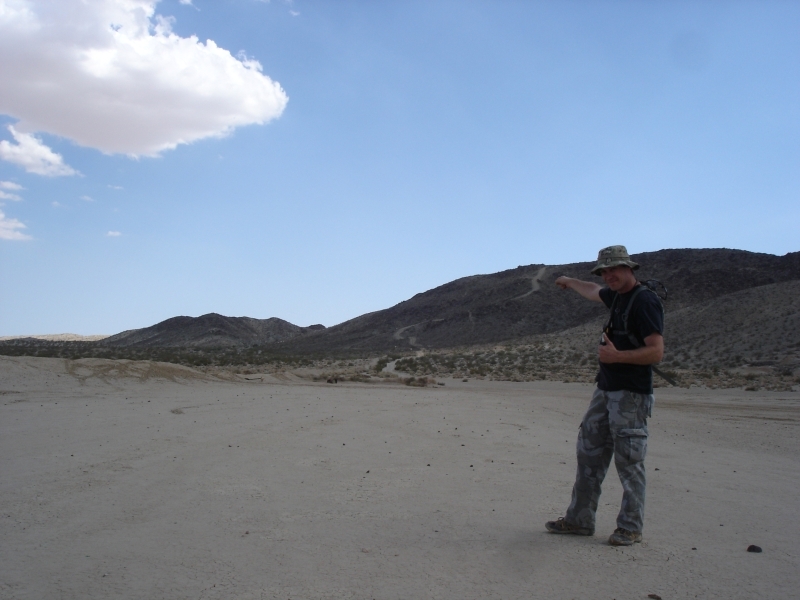 How about looking for meteorites next to a military base on the 4th of July? Three of us decided to search Emerson Dry Lake where only 1 meteorite had been found previously. It was a warm day, the temperature was just over 100*F but the occasional breeze kept things from getting too hot. Emerson Dry Lake is cut in two by the Twentynine Palms Marine Corps. 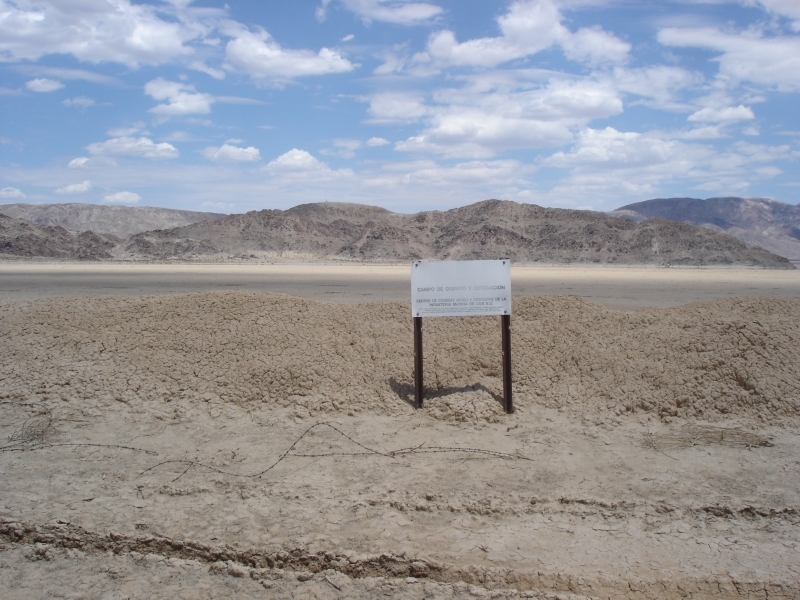 base, a berm runs the length of the lake bed marking the boundary. 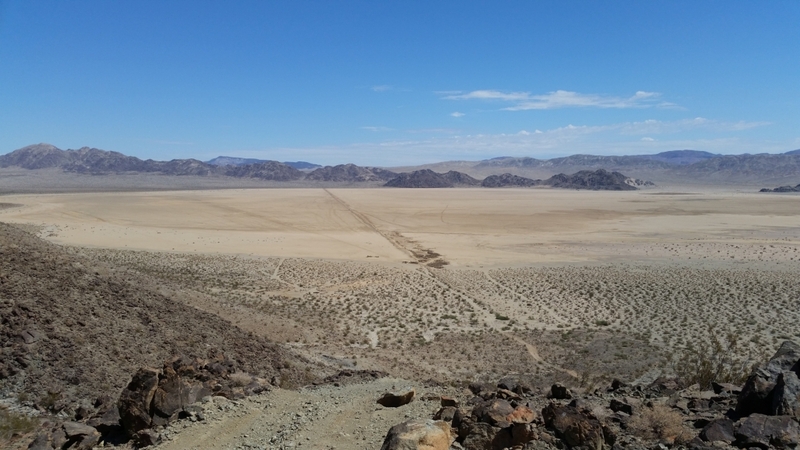 We came at the lake bed from the south and had to take a 4x4 trail along the bottom of a wash and over a mountain to avoid driving onto the military base. 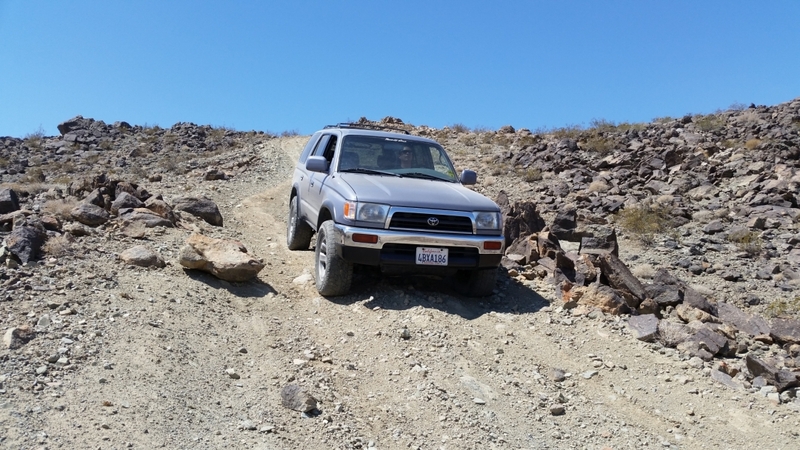 Robby had never taken his stock 4Runner on any serious off-roading, so he got some good experience on the drive in. Mark's FJ Cruiser has been modified, much like my 4Runner, to handle these conditions so he had no problem with the trail, but I had to get out and spot Robby through several obstacles. We aired down his tires for better traction and gave the 4-wheel drive system a good work out. We parked next to the find marker for the Emerson Dry Lake meteorite and started hunting to the north. 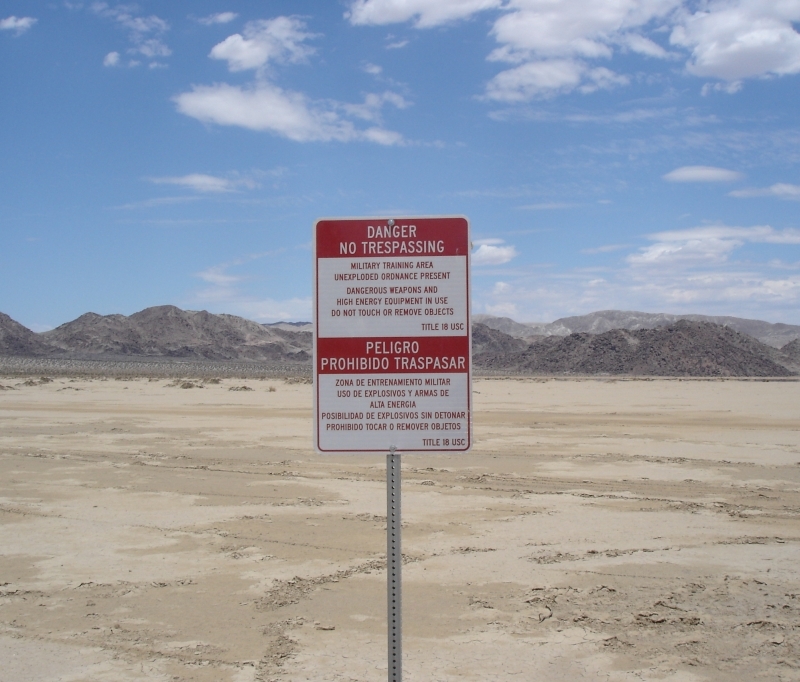 Twentynine Palms has been around for a long time, so as you would expect there are a lot of military "artifacts" to be found in the area - old bullets and shell casings and bits of metal from this and that. 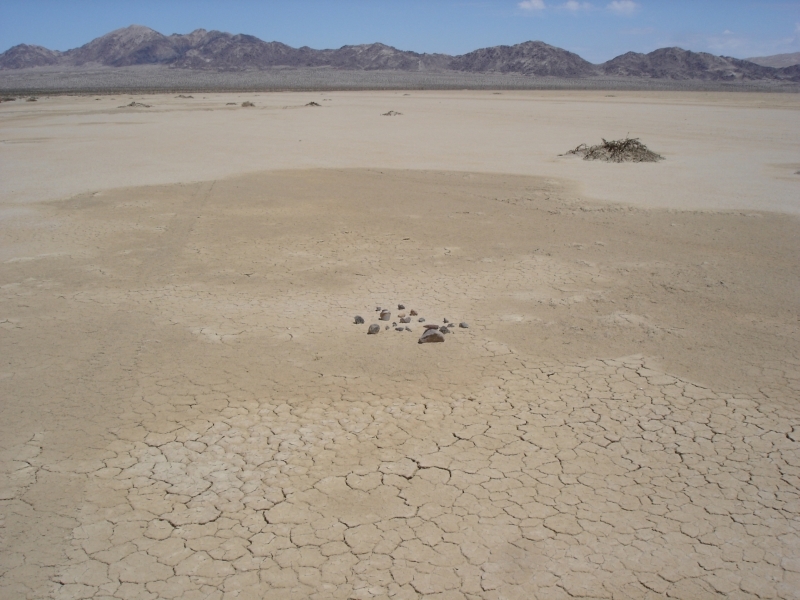 We left everything we found on the lake bed. Don't cross the berm or the armored vehicles with 50-caliber machine guns on the roof come, I've been told. After lunch we hunted the south part of the lake bed, making it all the way down to where we drove in. Robby points toward trail he conquered in his 4Runner. 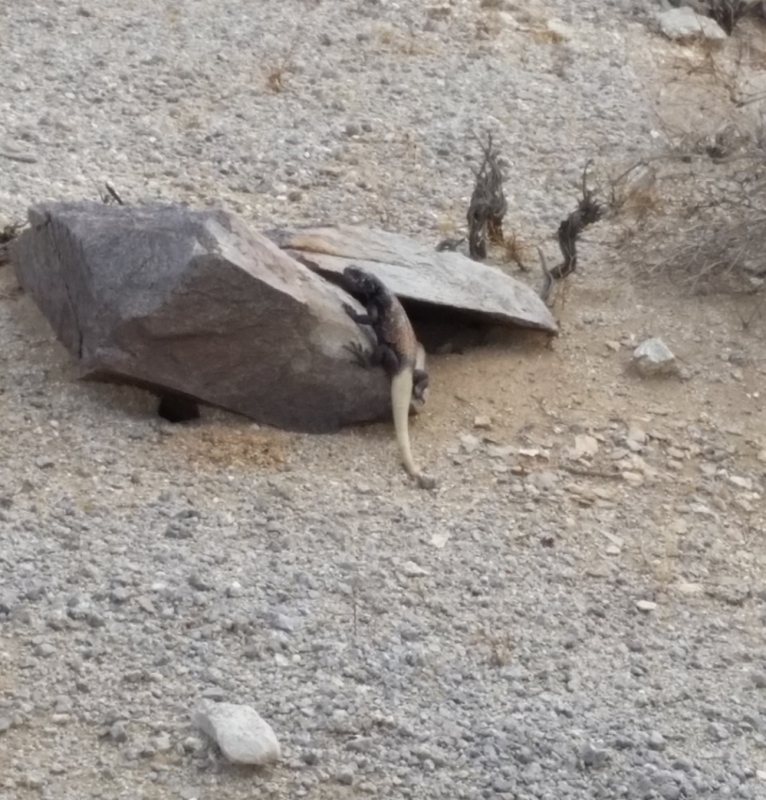 On the drive home we took a different route out and while we were up in some hills Mark spotted a large, black lizard. We all hopped out and I snapped the only photo before he ran under his rock. This is a mojave Chuckwalla.